I got a lot of gifts I loved this year however I think I love the 'thought' behind gifts the most. Anyone else agree? He hid a present for me and gave me a hint each day. I looked all over our apartment for it and Dave said I even looked right at it several times! 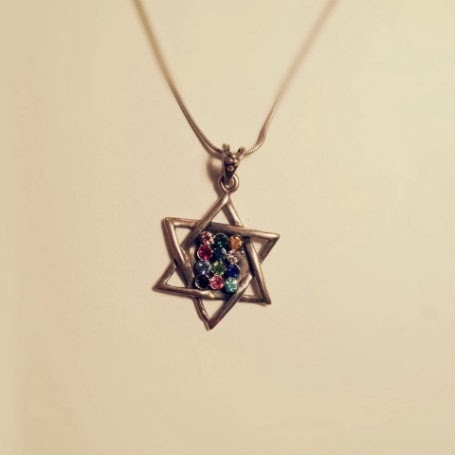 Thanks to my friends on Facebook they helped me figure out it was a necklace with the Star of David but I didn't actually find the necklace until Dave told me right where it was. Someone recently told me the meaning of the Star of David. The triangle pointing up represents God and the triangle pointing down represents man. When combined they represent God reaching down to man. The 12 stones are the breastplate that the priests wore. This next gift was made for me by my sister-in-law. 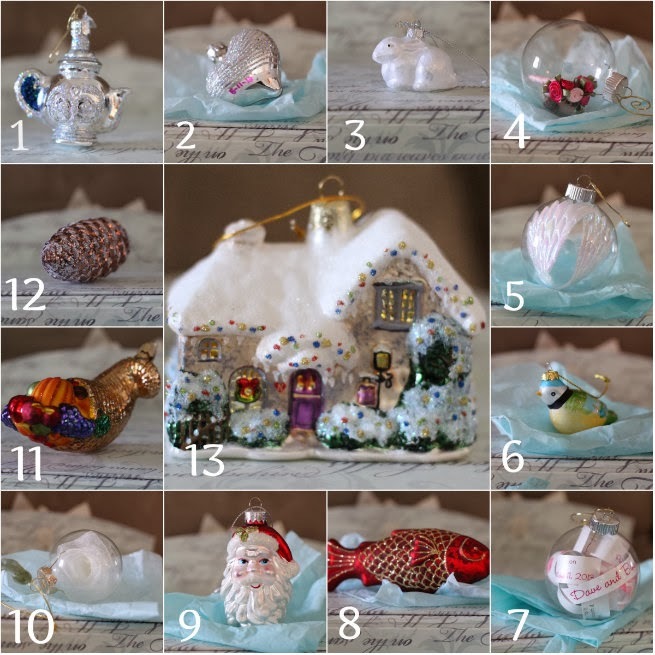 Each ornament resembles something and has a coordinating Bible verse. I have a small white Christmas tree that I'll be hanging these on next year. Heart - true love (John 13:34) *The heart has both of our wedding dates written on it. Do you put lots of thoughts into gifts? Did you receive any 'thoughtful' gifts? So sweet! I love your wedding invite ornament! Wow- your sister-in-law is so talented! What a great idea to have a lockbox of gifts. I bet you are always surprised by what your husband pulls out of there. My mother-in-law is pretty good about giving thoughtful gifts. She always knows what kind of book I would enjoy. This year she gave us all really nice robes, which sounds strange, but it was something we all needed and never would've thought to buy for ourselves! Wow, such creative and beautiful gifts! The necklace is beautiful! And those ornaments with Bible verses are so neat. I love the meaning behind your gifts! Beautiful and creative. I love those ornaments! Thanks, Rachel. I love it too and might just make this for someone some day so they can have set too. I love the necklace! It is so beautiful and meaningful! And I love the box of gifts ideas too. That is really, really sweet! Thanks, Lauren. I think it's really pretty too. these are so adorable! i LOVE LOVE thoughtful gifts! Catching up on your blog posts today after being back from vacation!! HOW fun. I love the necklace and I love the gifts from your sister in law. SO CREATIVE!!!! Where did she find the idea for each ornament representing something? You know, I have no idea where she got the idea. I'll have to ask her. I love the necklace too. Although ... I wore it and the chain gave me a huge rash =) ha! I'll be buying a new chain for it soon.